Rajalakshmi School of Business, Chennai has advertised for recruitment of Teaching Faculty- Professor / Associate Professor / Assistant Professor jobs vacancies. Interested and eligible job aspirants are requested to apply within 07 days from 28th November 2018. Check out further more details below. About College: RSB campus is quite different from traditional business school buildings; It is designed not only to foster learning but also to foster collaboration and networking. The campus include an Executive Education Classroom, 4 Theatrical Lecture Halls, 4 Specialization Classes, 9 Faculty Offices, 1 Library, a Coffee shop, 2 Board rooms, 2 Conference halls, Administration floor, 1 CXO Suite, 1 aesthetic cafeteria. 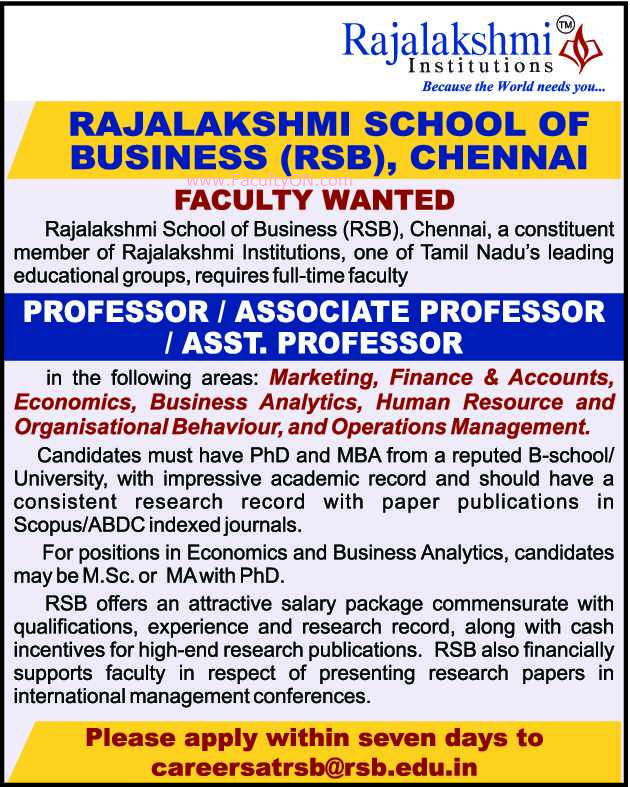 MBA / Ph.D. For the departments of Economics and Business Analytics, M.A or M.Sc with Ph.D may be considered. How to Apply: Interested and eligible candidates are requested to send detailed resume along with copies of certificates, PAN card, Aadhaar card and PP size photos to the email address given below.